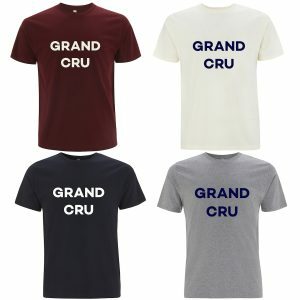 Our range of stylish T-shirts and sweatshirts are all about fusing design and wine in a sophisticated manner. Our clothing is carefully sourced from Fairtrade companies, using organic cotton and natural products. We design and screen print in the UK. 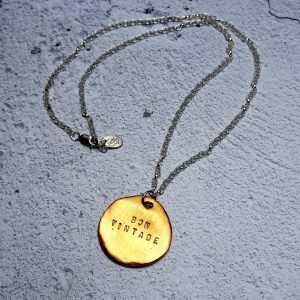 The Bon Vintage necklace is a statement yet classic piece. The gold plated medallion is perfectly imperfect, has a smooth finish and hand hammered lettering. If you love this you may also love the SANTÉ necklace which layers with it perfectly. 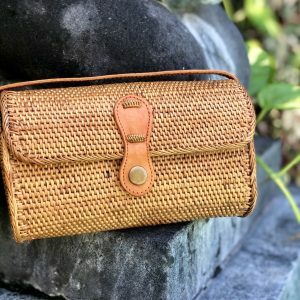 Beautiful and easy to wear rattan crossbody bag with leather strap. Hand crafted by Balinese women from rattan (ata) and leather. Works perfectly with all outfits for all occasions. Due to their individual handmade nature, each batik lining is different making them totally unique. 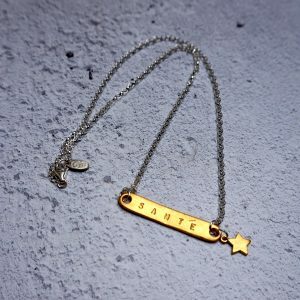 The SANTÉ necklace is a one-off limited edition piece in collaboration with the wonderful Chambers and Beau. The gold plated sterling silver bar is a classic and timeless piece. Hand stamped with SANTÉ meaning good health or 'cheers' in French. Comes with star charm. Wear solo or layer it up with other pieces to create an explosion of neck beauty. THIS PIECE IS BESPOKE AND CAN ONLY BE PURCHASED VIA THIS SITE. 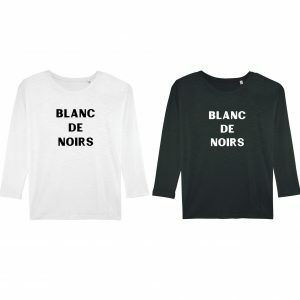 NEW - SANTÉ SWEATSHIRT This Sweatshirt is very lightweight and fine. Like the Premier Cru, it is super soft and unlike a normal heavier sweatshirt it is almost jumper-like. It has a large crew neck and set-in drop shoulder sleeves. Extremely comfortable and stylish, with enough fluidity to hang like a jumper over flowing skirts, tailored trousers or even over a dress. Please note that these are limited in stock. The Rosé sweatshirt is back and now with a classic raglan sleeve Slightly heavier organic cotton in a relaxed feminine style. Perfect for dressing up or down this sweatshirt works with jeans and skirts. Please note sizing when ordering different colours. Limited stock available now, more arriving beginning of March. BOLD sweatshirt WITH POCKETS ! Love love love this sweatshirt. The length, the shape, the weight, the neckline, I could go on. It works with jeans, skirts, over dresses. The design is a delicate snake print of milky tea, cream, black and sprinkles of gold. The perfect dress up or down sweatshirt. AND, this BOLD sweatshirt has pockets! so you can keep your paws warm when standing at the bus stop! Go on be BOLD. *NEW* Crochet mini shopper bag Handmade by the talented Lyndsey, the crochet mini shopper bag is such a brilliant design. Mon Petit Sac is a new brand to FWP By Rae. The crochet bag is based on a traditional square carrier bag, and can be carried either on the wrist, by hand or folded as a clutch. Perfect on its own, or in a bigger bag to keep your purse/keys etc separate. No need to dance around you handbag, you can swing it from your wrist. GIFT CARD Treat your friends and family to a gift card. To choose the amount for the selection below and put their address as delivery address. A card will be sent with their own special voucher code. BUBBLY SWEATSHIRT Joining the SPARKLING jumpers this year is our BUBBLY sweatshirt. A gorgeous bright tomato red, with metallic gold to add some sparkle and glamour. A perfect Christmas sweatshirt that can be worn outside the festive season. 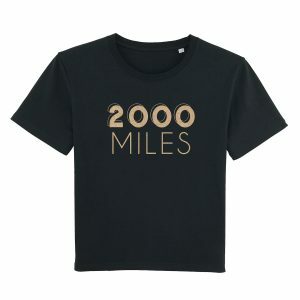 A lovely medium weight soft cotton in a unisex fit, yet narrow and neat enough to wear with skirts and still look chic rather than oversized. Or like me just throw on with jeans for instant glamour and let your bubbly personality shine through! NEW IN - ROUGE slogan sweatshirt in zebra print. This really is a statement sweater! 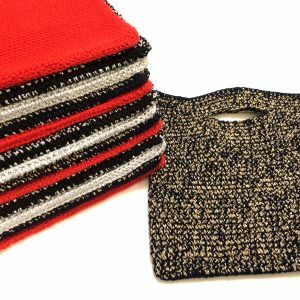 It's extremely lightweight, more like a jumper than a sweatshirt (if you like the fit of Premier Cru you'll love this), so looks fabulous under jackets, tucked into trousers, skirts and jeans or wear big over leather skinny jeans! ROUGE is the new rosé as we move into Autumn Winter, and this super bright red print is a great statement piece. It comes in navy or ash and is also available in a T-SHIRT version. NOTE: Some sizes sold out in a day, but more are arriving by Friday 13th October. 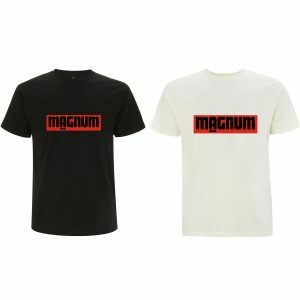 MAGNUM mens T-shirt, a cool classic fit made from 100% organic cotton. The MAGNUM t-shirt has been in the making for months, with the infamous moustache giving a nod to the iconic series of the 1970's hit staring Tom Selleck. Launching this just before November is my way of supporting Movember, the fundraising month for Prostate Cancer UK. My own father had prostate cancer and an old YOUNG work colleague had it. The emphasis being on 'young' as cancer doesn't discriminate age, which is why it's important for men to look out for the signs. £5 from the sale of each T-shirt will be donated to Prostate Cancer UK, not just throughout November. BON VINTAGE sweatshirt returns! The super stylish flash of bright Coral on a cream grey heather makes this a bright yet fresh statement sweatshirt. The cut is very similar to the Premier cru, but with a more structured and heavier un-brushed cotton, giving it a really cool classic shape. With the set in drop shoulder sleeve and subtle contrasting ribbed neckline, it will take you through every season and can be worn with a skirt or just jeans for a flash of colour. Please note, this is a cotton non fleecy sweatshirt.